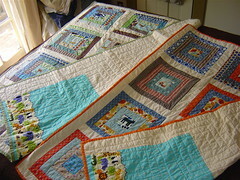 Currently I'm not doing this much sewing really, but Soule Mama linked to this quilt. Isn't it lovely? I love log cabins. I'm looking forward to doing some more sewing next week when the kids go back to school, well the big kids anyway!! Annie-Rose and I will just hang out.